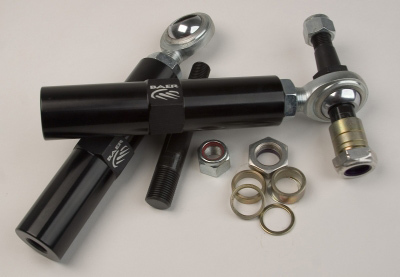 The Baer Tracker Tie Rod Kit from Kenny Brown Performance is made for lowered cars with altered camber or caster. When a car is lowered, it can actually make daily driving a lot more dangerous because of the way your stock tie rod ends react to bumps and other irregularities in the road. A tiny hole in the road can actually jar your car in a random direction with stock tie rods and cause an accident that endangers you and everyone else on the road. These Baer Tracker tie rods are designed to prevent wiggles and unexpected jerks during daily driving and track use for a safer ride and much more precise steering in your lowered Mustang. Kenny Brown Performance not only wants your ride to be fast and grippy around the race track, but safe and stable during daily driving to keep you out of harm's way and make you comfortable with the way your car handles. This Baer Tracker Tie Rod Kit does exactly that for a great price. So if you want to improve the accuracy of your steering and stay safe wherever you're driving, these tie rods are right for you. Give ModBargains a call at the number below to make an order or have any questions that you have answered by one of our experts. They would love to talk to you.